Despite being a scorcher of a day in Cape Town, with the mercury hitting close to 40 degrees celsius, I decided not to mess with a system that works and made my way over to Deluxe Coffee Works for an 11 o’clock coffee break. Joined by Imar and Tamara (both still on holiday – I hate them so much right now!) 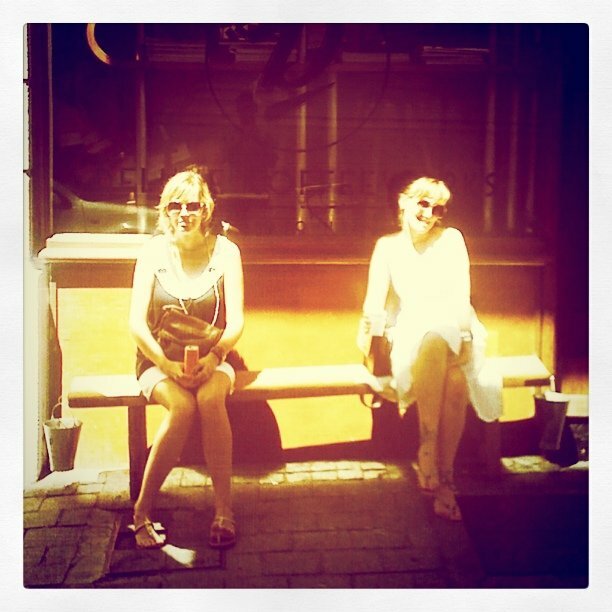 we braved the heat and settled down on the rickety little bench outside to savour the Mother City’s best caffeine fix. I was really looking forward to trying their iced-coffee for the first time in my few months of patronage, but was disappointed to find that they had done away with the cold beverage, as the little cafe has proved too humid to keep the ice in the machine slushy enough… especially on hot days like today. Pity, but I got over it soon and ordered the usual delish flat white.